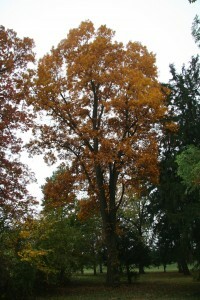 Pignut hickory is a common but not an abundant species in the oak-hickory forest association in the Eastern United States. Other common names for this tree are sweet pignut, coast pignut hickory, smoothbark hickory, swamp hickory, and broom hickory. Its pear-shaped nut ripens in September and October and constitutes an important part of the diet of many wild animals. The wood is used for a variety of products, including fuel for home heating. Mockernut hickory leaves are 8 to 12 inches in length with 7 to 9 thin, sharp-pointed, finely-toothed leaflets that are dark-green on top and hairy orange-brown on the underside.